1+1 Management - Agency founded by Marco Maida and Rob Newbould. Represents some of the most highly respected photographers, stylists, art directors, hair and makeup artists in the industry. 20th Century Fashion History - A profile of fashions by the decade, from the turn of the century to the punk & party-filled 1980s. andi Fashion - A women's apparel directory identifying the best apparel and fashion information sites and the best, most reliable sources of clothing and accessories. Angel of Fashion - Fashion directory, resources, links: designers, fashion zines, merchandise mart, fashion business, modeling, online shopping, salons and haircare, photographers, cosmetics advice, alternative fashion. Apparel News - Fashion news, trade shows, books, events. Apparel Resources - Industry news and resources, including: Buying Agents, Buring Houses, fasion magazines, Air Cargo Info, Vessel Sailing Info, Exchange Rate, Inspection Agenicies, Trimmings, Exporters, Fabric, Machinery, Stores/Brands, Interviews, and more. Art Partner - A leading artists management and creative content agency with offices in New York, London and Paris. In addition to artist management and representation, art partner provides a full range of services to its artists and clients including syndication and licensing, fine art print sales and the development and promotion of books and exhibitions. Advertising clients include Louis Vuitton, Burberry, Benetton, Versace, Dior, Giorgio Armani, Chanel, Shiseido, Miu Miu, Estee Lauder, Bulgari, D&G, Michael Kors, Hugo Boss, Revlon, Calvin Klein, GAP, Mango, Givenchy, L'OREAL, Zara. Editorial clients include US Vogue, French Vogue, British Vogue, Italian Vogue, L'Uomo Vogue, German Vogue, Australian Vogue, V Magazine, W Magazine, Vanity Fair, Harper's Bazaar, LOVE, Numero. Ask Andy About Clothes - Men's clothing advice. Bath in Fashion - Showcasing fashions on the catwalk, fashion celebrities and authors sharing their style and stimulating debate as well as hands-on workshops; style counsel; exhibitions, installation. 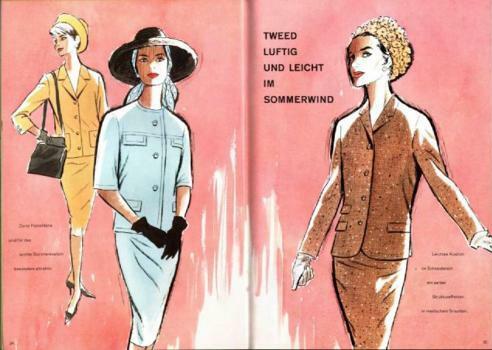 Berg Fashion Library - Provides integrated text and image content on world dress and fashion throughout history. Invaluable for scholars, students, professionals, and anyone interested in dress, it includes the Encyclopedia of World Dress and Fashion, an extensive E-Book collection, a vast image bank, reference resources and more. BharatTextile - Information on the textile, apparel, garment and fabric industry from the world and major Indian markets and cities. Costume Gallery, The - Host to over 500 web pages and 2,000 images of fashion and costume. Costume Site, The - Costuming sources for historical, science fiction and fantasy. Design, art, and images, museums, history and research, instruction, events, organizations. Council of Fashion Designers of America (CFDA) - Membership consists of more than 400 of America's womenswear, menswear, jewelry and accessory designers. Diana Vreeland - The Vogue years. Also see Wikipedi. Vreeland was a noted columnist and editor in the field of fashion. She worked for the fashion magazines Harper's Bazaar and Vogue and as a special consultant at the Costume Institute of the Metropolitan Museum of Art. She was named to the International Best Dressed List Hall of Fame in 1964. DNA Model Management - modeling agency in New York City, established in 1996 by Jerome and David Bonnouvrier, and is one of the top-three agencies in the world. DNA represents numerous notable models in the industry, including: Linda Evangelista, Alessandra Ambrosio, Natalia Vodianova, Amber Valletta, Doutzen Kroes, Shalom Harlow, Raquel Zimmermann, and Kristen McMenamy. Dutch Design Awards - A series of awards to honor Dutch designers in a number of categories, including fashion. Fashion Edits - Provides a comprehensive directory of sought-after showrooms, trade show information, merchandising advice, fashion trends, eco-friendly styles, and industry news. Fashion Group International (FGI) - A global non-profit association of over 6,000 professionals of achievement and influence representing all areas of the fashion, apparel, accessories, beauty and home industries. Fashion Institute of Design and Merchandising (FIDM) - Private college with campuses in Los Angeles, San Francisco, San Diego and Orange County, California. FIDM offers programs in Fashion Design, Interior Design, Fashion Merchandise Marketing, Textile Design, Visual Communications, Graphic Design, Cosmetics and Fragrance Merchandising, Theatre Costume, International Manufacturing and Product Development, and Apparel Manufacturing Management. Fashion Institute of Technology (FIT - State University of New York) - New York City's internationally recognized college for design, fashion, art, communications, and business. Fashion Model Directory (FMD) - The world's largest fashion database about professional female fashion models, modeling agencies, fashion designers and brands, serving over 125,000 images, videos and daily fashion news and updates. FMD is one of the most reliable and accurate fashion information source for worldwide media. The portal includes a large fashion community with discussion boards. Fashion Net - Guide to fashion on the net, fashion news, runway profiles, NYC guide, chat room, job listings, message board. Fashion on Net: Modaitalia - Italian fashion portal. Top Italian designers are present, sometimes in a matter of a few hours after the catwalks finish, with their latest collection images and comments. Fashion Spot, The - A fashion industry forum where fashion influencers meet to discuss fashion design, designer's collections, models, fashion trends, celebrity fashion, cosmentics and shopping. Fashion Week (Wikipedia) - A fashion industry event, lasting approximately one week, which allows fashion designers or "houses" to display their latest collections in runway shows, and buyers to take a look at latest trends. And most importantly let the industry know, what's "in" and what's "out" for the season. The most prominent fashion weeks are held in the fashion capitals like Milan, Paris, London, and New York City. Fashion Windows - Fashion designers, visual merchandising, mannequins, store windows. Fashionshowonline - Fashion news, career information, upcoming events, or designer profiles and product lines. Fibre2Fashion - Textile and fashion news portal provides online textile marketplace and garment trade business resources. Firstview - Clothing, fashion collections, and fashion accessories online. Flickr - Fashion photography and search. Garment Collection (Columbia College Chicago) - research collection documenting the evolution of 20th century fashion. It includes women's, men's, children's, military, and ethnic (non-Western) clothing, costumes, textiles, and accessories. This collection holds clothing from moderate to high price ranges, as well as, home-made, designer, and mass-produced items. GEN ART - Showcases emerging talent in film, fashion and the visual arts through the production of fashion shows, film festivals, art exhibitions and other events. Gentleman's Page, The - The Lively Arts History Association presents the Gentleman's Page: a resource for those who wish to look and act like; or perhaps better understand, the 19th Century American man. Google Images - Search for images of any model. Grace Coddington - Backgrounder to career of former model and the creative director of American Vogue magazine. Harper's Bazaar - Harper's Bazaar pictures and news on top fashion models. Infomat - B2B fshion industry information. Find 350,000+ international designer showrooms, retailers, manufacturers and suppliers. London College of Fashion - Specialist college for fashion in the UK offering courses ranging from fashion design, technology, management and marketing to communication, promotion and image creation. London Fashion Week - Fashion news, shows, exhibitions, designer directory, Inside London. Sponsored by VS Sassoon and organized by the British Fashion Council. Men's Flair - Men's fashion and style magazine. Men's Shoes - Learn about the latest styles, as well as how to wear the classics, how to get a good fit, and more with this complete guide to men's shoes. Metropolitan Museum of Art, The: The Costume Institute - Provides a collection of more than thirty-five thousand costumes and accessories represents five continents and seven centuries of fashionable dress, regional costumes, and accessories for men, women, and children, from the fifteenth century to the present. The Costume Institute organizes one or more special exhibitions annually; due to the sensitive nature of textiles, the collection is not on permanent public view. However, two fashion-focused tours are available year round: Fashion in Art, a tour led by docents discusses costume history within the context of the Museum's collections of armor, textiles, paintings, sculpture, and decorative arts; and Costume: The Art of Dress, a recorded audio guide narrated by actress Sarah Jessica Parker highlights historical costume throughout the Museum's galleries. Model Alliance, The (MA) - A growing network of models and industry leaders dedicated to improving working conditions in the American fashion industry. Models have an industry voice through the MA. Model Mayham - Where professional models meet model photographers. Model Manual (New York Magazine) - A guide to the modeling scene with thousands of images, from ads to parties to runway shots. Models.com - Modeling industry news. Also see Top 50 Models page. Museum at the Fashion Institute of Technology - Best known for its innovative and award winning special exhibitions, including London Fashion, which received the first Richard Martin Award for Excellence in the Exhibition of Costume from the Costume Society of America; The Corset: Fashioning the Body, which explored the most controversial garment in the history of fashion; and Madame Grès: The Sphinx of Fashion, a monographic retrospective that examined the working methodologies and unique aesthetic contributions of a great couturier. MyFashionDatabase - Aggregates images from fashion magazines across the world and tags the fashion professionals involved. Paris Fashion Shows - Paris runway fashion show photography, defiles-paris, La Mode Francaise photos, Prêt-à-Porter, Photographie Mode France, Paris couture, Mode à Paris, French fashion, Paris editorial fashion photography, Paris syndicated fashion photography features, Paris pasarela, France fashion shows, modas pasarela. Partial Coverage - Retro, authentic vintage and pinup lingerie; history of lingerie. SHOWstudio - An online fashion broadcasting company committed to pioneering, live fashion media. Led by photographer Nick Knight, SHOWstudio has consistently broken new ground with its experimental interactive projects, films and live performances. Its unique collaborations with the world's most sought-after and influential photographers, artists, writers, designers and cultural figures are broadcast live, in real time on the award-winning SHOWstudio website. SoWear - A fashion collective dedicated to promoting emerging talent in the field of fashion. Storm Models - Major agency for modelling talent. Streeters - A global management agency, representing the biggest names in hairdressing, make-up, styling, set design, photography and other creative services. Supermodels.nl - The worlds largest information repository of today's fashion models. Textile Industry History - A site devoted to the history of mills, people and companies. Top Fashion Models - Provides complete and up-to-date information on supermodels, fashion male models and fashion female models from all over the world and present their artworks to wide audience. Tumblr - Fashion models on Tumblr. Valentino Garavani Museum - Enter the world and life of Valentino Garavani. Journey through his real time 3D Museum and discover his glamorous designs. Voguepedia - The world of fashion in Vogue. Wikipedia: Fashion - Excellent resource for background information on the industry and individual models. This webpage last updated on Friday, April 28, 2017 3:22 AM.